This wine is the most recent addition to our domain. This is a very small parcel of 28 acres, on a very rocky soil, on the most northern part of the Saint Amour appellation, overlooking the village of Saint-Véran. 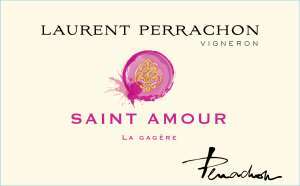 There is nothing more romantic than a wine which features the word love, albeit in French, on the label. This is a stunning, silky-smooth, strawberry-themed wine with a delicious, lip-smacking finish and never-ending food-matching skills. Drink it will anything you fancy and it will reward. An intense rubis color, for a sensual wine, with a lot of personality, very delicate, a nice balance between the fruit and the tannins. Serve at 14°c with a lamb roast served with beans or with a soft cheese.